Revered president and liberation struggle icon Jomo KENYATTA led Kenya from independence until his death in 1978, when current President Daniel Toroitich arap MOI took power in a constitutional succession. The country was a de facto one-party state from 1969 until 1982 when the ruling Kenya African National Union (KANU) made itself the sole legal party in Kenya. MOI acceded to internal and external pressure for political liberalization in late 1991. The ethnically fractured opposition failed to dislodge KANU from power in elections in 1992 and 1997, which were marred by violence and fraud, but are viewed as having generally reflected the will of the Kenyan people. The country faces a period of political uncertainty because MOI is constitutionally required to step down at the next elections that have to be held by early 2003.
the Kenyan Highlands comprise one of the most successful agricultural production regions in Africa; glaciers on Mt. Kenya; unique physiography supports abundant and varied wildlife of scientific and economic value. Kenya is well placed to serve as an engine of growth in East Africa, but its economy has been stagnating because of poor management and uneven commitment to reform. In 1993, the government of Kenya implemented a program of economic liberalization and reform that included the removal of import licensing, price controls, and foreign exchange controls. With the support of the World Bank, IMF, and other donors, the reforms led to a brief turnaround in economic performance following a period of negative growth in the early 1990s. Kenya's real GDP grew 5% in 1995 and 4% in 1996, and inflation remained under control. Growth slowed after 1997, averaging only 1.5% in 1997-2000. In 1997, political violence damaged the tourist industry, and Kenya's Enhanced Structural Adjustment Program lapsed due to the government's failure to maintain reform or address public sector corruption. Severe drought in 1999 and 2000 caused water and energy rationing and reduced agricultural sector productivity. A new economic team was put in place in 1999 to revitalize the reform effort, strengthen the civil service, and curb corruption. The IMF and World Bank renewed their support to Kenya in mid-2000, but a number of setbacks to the economic reform program in late 2000 have renewed donor and private sector concern about the government's commitment to sound governance. Long-term barriers to development include electricity shortages, inefficient government dominance of key sectors, endemic corruption, and high population growth. Kenya is the East African powerhouse of the coffee world. Both in the cup, and the way they run their trade, everything is topnotch. The best Kenya coffees are not sold simply as generic AA or AB. They are specific auction lots sold to the highest bidder, and heated competition drives the prices up. Their research and development is unparalleled. Their quality control is meticulous, and many thousands of small farmers are highly educated in their agricultural practice --and rewarded -- for top level coffee.In general, this is a bright coffee that lights up the palate from front to back. It is not for people who do not like acidity in coffee (acidity being the prized bright notes in the cup due to an interrelated set of chlorogenic acids). 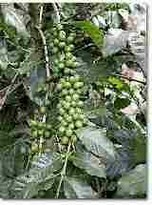 A great Kenya is complex, and has interesting fruit (berry, citrus) flavors, sometimes alternating with spice. Some are clean and bright, others have cherished winey flavors. I am proud of our consistently excellent selection of Kenyas! It takes a lot of work to sort through the many samples available to find the few that are truly complex, that alternate in the way you sense them to make the coffee more than just your standard, pleasant cup, but a real experience.On a historical note: coffee was introduced into Kenya by way of Ethiopia at the end of the 19th century. It was brought for local cultivation by the Fathers of the Holy Spirit congregation, another case of the long and twisted road that religion and coffee have traveled together! None. Localized use of chemicals is rare, due to excellent agricultural methods: mulching, pruning, mowing etc. 1800's: By the Fathers of the Holy Spirit Congregation: Bourbon in 1911 from Reunion: Kents in 1920 from the Indies.